Family Histories as published by Others that I have used to compile Deep Roots & Tall Trees. I have a copy of each publication and am willing to share info with anyone who contacts us. 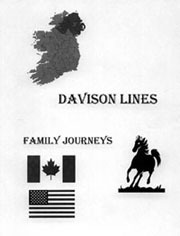 A compilation of the DAVISON Family in a genealogical format. This journal has many interesting personal antidotes and obituaries. Phil is a descendant of the “Michigan Davisons” and his research of this branch of the tree helped fill in a large portion of the work I was attempting to complete. This is the history as far as we have been able to secure, facts extending from the early 1800's to the present time, of the descendants of Robert SAUNDERS and Jane WYNNE, who were born in Kilkenny County, Ireland in the years- 1802 and 1812 respectively. This history was begun by the authors for their immediate family in an effort to undertake to bring back to life another age and another group of people who would otherwise live only in disconnected documents and in isolated archives, but as the romance of the lives of our ancestors unfolded, we decided to share our findings with all of the descendants of Robert SAUNDERS and Jane WYNNE. Jim Gregg, the son of Sadie's sister Ida, has meticulously transcribed this diary. The original copy is with Sadie Cameron Pilgrim, her daughter. 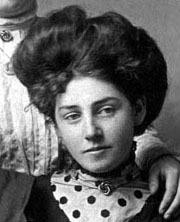 The diary started on May 4, 1906 when Sadie was 16 and ends on Dec. 16, 1907. A very interesting look at the day-to-day activities of young people living in rural Ontario at the beginning of the 20th Century. The family lived in Greenock Township, Bruce County, just west of the village of Pinkerton. Click here to read Sadie's Diary. Copy received from Margaret McCLURE in 1993, author unknown. Many families that originally settled in the Gore of Greenock and intertwine with those recorded on this web site. I have no idea who the original genealogists were and if anyone out there knows please contact us so that they can be properly acknowledged for the wonderful legacy they have passed on. The RUMIG Family is featured in this Family History. "In 1840, Robert Carson, a settler from Donegal, Ireland, traveled north from Toronto. As he passed through what is now Grey County, he came upon a fine lot of land, heavily wooded, and there proceeded to build a shanty. The shanty was built on the seventh concession of Sullivan, just a little north of the present Village of Desboro." Robert's son married Rebecca DAVISON and becomes a part of the WATSON Family. Thomas' son Thomas married Jane CARSON and becomes a part of the WATSON Family . “ We have reached the end of the memoir from 1882 to the beginning of 1974. It is just one hundred and fifteen years since our grandparents were married September 13th, 1858, in Ireland." Submitted by: Madeleine O'Reilly, Matilda (Ried) Watson and Gertrude Robbins. This is a wonderfully detailed history of the Reid Family in Manitoba. There are connections to the Andrew WATSON & Nancy REID and ALEXANDER Families through MORE, WATSON and ALEXANDER. Unfortunately there does not seem to be any connection to the John REID & Eliza Jane McCULLY Family. Geoff Pinkerton has done a great job of researching all connections to the PINKERTON surname. Although we have no PINKERTONs in our tree this work is of historical and geographical interest. There are two good articles by James E. Connell, Pinkertons in Bruce and Water Power at Pinkerton under the heading Pinkerton Manuscripts. "Thanks to all who sent me information for "the book". I hope you enjoy reading it as much as I enjoyed putting it all together. 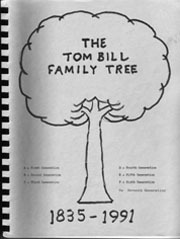 Thanks to Phyllis Bill Quam for her work on the original family history in 1975"
by Eleanor Crosby Olson, inside the front cover of this wonderful Family History. This family makes up a large part of the Thomas METCALF & Mary SANDWICH Family and can been seen by going directly to Alice Marie METCALF or clicking on Thomas METCALF to see the entire METCALF Clan.